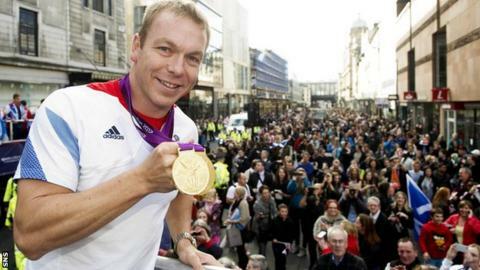 Sir Chris Hoy has won more Olympic gold medals than any other British athlete in history. Sir Chris Hoy's dedication to training set him apart from other athletes, according to former Team Scotland cyclist Richard Moore. Six-time Olympic gold medallist Hoy is to receive the lifetime achievement award at the BBC Sports Personality show on Sunday in Glasgow. And 1998 Commonwealth Games cyclist Moore says it is well-deserved. "That's why Chris was so good. For him, every training session was important, it really mattered," he said. Moore was in the same team as Hoy in 1998 and has since written cycling books, including one about the track legend. "He worked incredibly hard and was a very good trainer - not all athletes are," he said. "Some love competition and are not so keen on the daily grind of training, but he loved the training as much as the competition and I think that's why he kept going for so long and was so successful. "He made gradual improvements every year, which is a great lesson, a great example for other athletes. "It was just a little bit more work every year, a little bit more improvement the next." Hoy retired from competition in 2013 having enjoyed a record-breaking career that led to more Olympic gold medals than any other British athlete in history. He won his first Olympic gold medal in 2004 in Athens and then, four years later, won three golds at the Beijing 2008 Games. Hoy completed his set of gold medals with two at the London 2012 Olympics. Moore highlighted Hoy's attitude and personality as helping make him such a popular figure on and off the track. "I did try to find people with bad things to say about him for my book because I wanted it to be balanced, but it was very difficult," he added. "He was incredibly single-minded and focused and they can be euphemisms for a bit of selfishness, but I think that's an essential trait in an athlete. "Chris treated everybody exactly the same and, when he did retire, everybody who worked at the velodrome in Manchester, where he would train every day, would have said the same thing about him - that he was very popular and was always very generous with people and spoke to everybody the same. "He was universally liked and still is, he was a member of the coaching team at the recent World Cup in London and I think his presence helps some of the younger riders, especially, who feel emboldened by having Chris Hoy in their ranks. "And, again, unlike some athletes who find it difficult to explain the nuts and bolts of things, he's good at communicating."